Close encounters and flying saucers also have a place in socialist theory. The posadists (supporters of Juan Posadas) in Latin America believed this concept was a logical extension of Marxist dialectical materialism. Posadas led a group of the Trotskyist Fourth International in Argentina. He was especially interested in the Chinese and Russian space programmes, and wrote a pamphlet in 1971 called La Ciencia Espacial. He envisioned the extension of the socialist revolution to outer space. 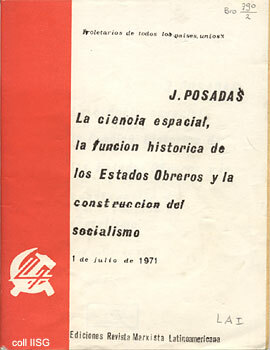 Many pamphlets by Posadas and the Posadists can be consulted in the IISH library. Timothy Snyder’s new book Bloodlands: Europe between Hitler and Stalin is getting some attention. It sounds fascinating but flawed. Here are two sample reviews: by Neal Ascherson and by Richard J Evans. (More reviews, from automatically generated links, at the bottom of the page.) Also read this great piece by Snyder on totalitarian Belarus: In Darkest Belarus. The Lost Revolution: The Story of the Official IRA and the Workers’ Party by Brian Hanley and Scott Millar has also gotten a fair amount of press, rather more surprisingly. Here’s reviews by Daniel Finn, Conor McCabe, and Chris Gray. Other book reviews by Andrew Coates: ﻿Francis Spufford’s Red Plenty﻿ (on Stalinism’s “golden age”), ﻿John Holloway’s Crack Capitalism﻿. Mike McNair has had an interesting series in the Weekly Worker on Trotskyist entrism in the Labour Party over the years, which I keep meaning to link to. Here’s the final episode. Also in the WW: Jack Tansey defends left communism. Sean Matgamna’s very belated obit for Ernst Mandel. Also from the AWL: Dale Street on How Stalinism crushed the Vietnamese Trotskyists, and Matgamna on what a revolutionary party is and is not. Big Flame history blog: on some other radical history projects on the web. Trotskyism: new blog on IS origins; new blog on IMG history. Anarchism: Brighton SolFed on the IWA conference in Leon, Spain. An anarchist flow-chart by Division by ZerO. Celebrating 100 years of the CNT. Labour history: A tale of two speeches – John Lewis to the CIO, 1937, Richard Trumka to the AFL-CIO, 2010. Democratic socialism: Happy birthday, Oscar Wilde, Fabian anarchist. In this issue, some Trotskyist stuff, and then some Orwellia, and finally some dispatches from the real world. I’ve been down on Alan Woods lately, for his support of the soft-Stalinist authoritarian populist regime of Hugo Chavez, which in turn has supported the repression of the working class in the Islamic Republic of Iran. So, in the spirit of ecumenicism, I have been spending time at his website, and am dedicating this special edition of From the Archive of Struggle to Woods and his guru Ted Grant. Down with the revisionists, running dogs, etc! Like in the Brazilian article, Petkoff referred to Woods as the latest of Chavez’ “political advisers” and the man who got Chavez to admit that he was a Marxist-Leninist … like Petkoff once was when he was a 60-70s guerrilla. Here’s Wikipedia on Petkoff, ex-Stalinist turned liberal social democrat. I can’t find the article on-line, but just Woods’ reply (see here). I’m a bit of a fan of Istvan Meszaros, and would like more politicians to read his work. Any readers who can provide more info on all of this, please do. Meanwhile, as already reported, Woods’ Iranian comrades have deserted his micro-movement, due to his apologies for Chavez’s support for the tyrannical regime in Iran. Here is the newly launched website of the Iranian Revolutionary Marxists’ Tendency. Here is a website, KarlMarx.Net, which is associated with the IRMT and their supporters. Among the documents are something very interesting by Pat Byrne (who I think is from the Alliance for Green Socialism) on the origins of the slate system for leadership voting in Leninist parties (also published at Tendance Coatesy, with better formatting to make it more readable, and by A Very Public Sociologist), and a Marxist reply by John Gandy to Woods’ series on anarchism mentioned here. There is also an interesting document on the split in the IMT from the Learning from Our Past group here. Also read: David Osler’s review of Richard Gott on the Bolivarian revolution. Also read: LabourStart’s news from Iran: Journalist who wrote about and defended union workers gets long jail term 2010-04-07 [Radio Free Europe]; IFJ Urges Iran to Release Detained Journalists 2010-03-22 [IFJ]; ‘New minimum wage rate spurs widespread indignation’ 2010-03-16 [Iran Labor Report]; ‘Forcing hunger on Iranian workers in the new year’ 2010-03-16 [Iran Labor Report]; Worker Protest in the Age of Ahmadinejad 2010-03-16 [Middle East Report]; Where Life Reeks of Death: Working Women and Child Laborers2010-03-07 [Iran Labor Report]; Union Leaders Under Attack 2010-03-07 [Iran Labor Report]; Workers’ Protest in Isfahan 2010-03-07 [Iran Labor Report]; IFJ Condemns Closure of Newspapers in Iran 2010-03-06 [IFJ]; ‘Kaleidoscopic’ Worker Protests Grow in Iran 2010-02-26 [In These Times]. Moving on from Ted Grant to his evil twin Gerry Healy, possibly the most destructive force ever on the British far left. Or, rather, to Healy’s disciple Corin Redgrave, whose death recently I’ve only touched on in passing. 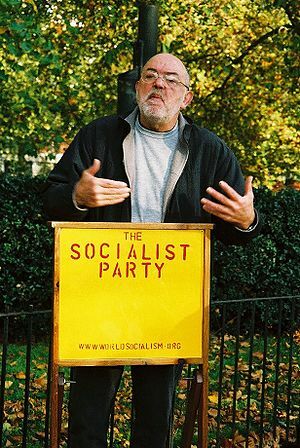 Read: Corin Redgrave: Traitor to Marxism; Gerry Healy and the WRP; The Daily Telegraph, Corin Redgrave and a Libel Case; Corin Redgrave, authoritarian figure; Corin Redgrave: scenes from a political life; and What has the Left got to be so smug about?. And, from the archive, No One Likes Us, We Try Not To Care. Having already posted this, here is another Orwell Prize nominee, Madame Miaow, on George Orwell. Recommended. 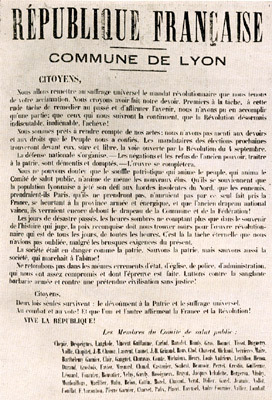 Tolpuddle guides go on strike; Kyrgyzstan: colour revolution and permanent revolution; U.S. and Colombia Cover Up Atrocities Through Mass Graves; The Rights of Mother Earth: Bolivia Births a New Revolution; The harvest of death in Canada; India’s coalfire workers. At AVPS, an interesting discussion on what actually “Stalinism” is. At Coatesy’s place, Lindsey German and the Trotskyist Tradition, on democratic centralism, the SWP and Trotky’s ambiguous legacy. From Michael Ezra, some real Stalinists, those who defend North Korea. Radu Cosasu writes that Albert Camus was “neither communist nor anti-communist”, a nuance difficult to digest for those “incapable of seeing the Left as anything but communist” (issue 310); and Sever Voinescu explains why such nuances are impossible for the moment in Romania: the country “never had an anti-communist Left; at most, and emerging just now, it has a Left that is indifferent to communism”. Some features from the Alliance for Workers Liberty, some new, some from the archive, below the fold. I have already included some of these in my From the Archive of Struggle series, but, hey, you can’t have too much of a good thing! Also, further down, a small number of other articles, including Eric Lee on Trotsky and some recent pieces from Against the Current. Rosie on Orwell as Autumn and war advance. AWL’s Jim D on SWP’s Keith Flett on Derry 1969. Photography and memory. The posthumous life of Leon Trotsky. WWII and the socialist project today. Radical thinkers? This week, BBC Radio 4’s Book of the Week is the touching, amusing memoir of growing up on the American far left, When Skateboards Will be Free, by American-Iranian Said Sayrafiezadeh. Episode 2, this morning and repeated just after midnight, covers the Party deciding he and his single mother should move to Pittsburgh. This is the American SWP, portrayed perfectly. The title refers to his mother not letting him have a skateboard – until after the revolution, when they’ll be free. Related: Gary Younge “Memoirs of a teenage Trot”, on being a WRP member in the 1980s. Previously: Trotsky on TV/Trotsky on Book of the Week. From National Review Online’s Uncommon Knowledge TV show. Each episode is around 6 minutes. Pretty good from the superficial listen I’ve had. • Trotsky with Hitchens and Service 2: the defeat and exile of Leon Trotsky. • Trotsky with Hitchens and Service 3: What if Trotsky, rather than Stalin, attained control of the Soviet Union? • Trotsky with Hitchens and Service 5: Trotsky today – scrutinizing the modern romantic view of Leon Trotsky. ADDED: Lesley Chamberlain “Twilight in Mexico” in WSJ on Trotsky: Downfall of a Revolutionary by Bertrand M. Patenaude (published in the UK as Stalin’s Nemesis, which I blogged about here, when it was Radio 4’s Book of the Week. More from Bookhugger, Ardmayle, The Tablet. More later today about the current Book of the Week, which also has a Trotskyist theme. ). Harry Barnes remembers his father (beautiful piece). Histomatist defends Trotsky. Martin remembers to remember Bastille Day (and Casablanca). Rosie is underwhelmed by Katyn. Dennis Healey remembers the Italian campaign but can’t remember who wrote Lili Marlene. 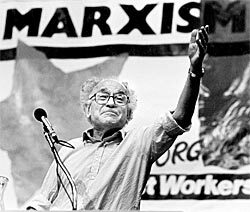 Ed Walsh reviews Leo Panitch’s call for a renewal of socialism. Conor McCabe remembers the 1955 Irish/Yugoslav soccer international. The Irish Left Archive retrieves the Anarchist Worker of 1979. 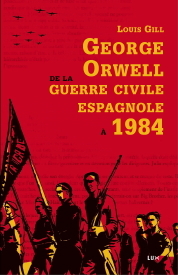 Bataille Socialiste remember Marceau Pivert with Orwell in Spain. Bataille Socialiste rescue the legacy of Charles Allegier. Entdinglichung archives The Left. Hillel Ticktin and Adam Buick debate Trotskyism. Beat the heat in California: solidarity with agricultural workers. Against the murder of militants in Chavez’s Venezuela.